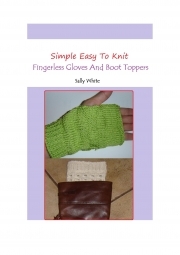 Description of "Simple Easy To Knit Fingerless Gloves And Boot Toppers (eBook)"
Sally White is based in South Africa. She writes books by drawing inspiration from subjects that interest her such as hobbies, facts and information regarding health issues. Reviews of "Simple Easy To Knit Fingerless Gloves And Boot Toppers (eBook)"